With summer around the corner, I’m constantly thinking of ways to enjoy a vacation without completely ruining our family budget. Why do vacations have to be so expensive? Even with the best tips on how to save money on vacation, you still need to set aside a decent chunk of change in order to go on a family vacation. A vacation seems like the last thing that you can afford when you’re working to pay off debt and yet it also is extremely crucial for your sanity to take a break and enjoy some time off. So what is a family on a budget supposed to do for their family vacation? I’ve recently discovered staycations and think they are the absolute best thing. We live in southern California and there is so much to take advantage of locally, like camping, hiking, beaches, but yet it feels like we never get to enjoy these benefits because we’re so busy with our day to day lives. What is a staycation? A staycation is where you enjoy the benefits your own city has to offer. You can either sleep in your own house, or get a hotel for a couple of nights in the same town that you live in. One of my favorite ways to do a staycation is a campervan rental. Honestly I prefer sleeping in my home because I found the natural cures for sleep deprivation. Here are three ways staycations are the best and how they can help save you lots of money. 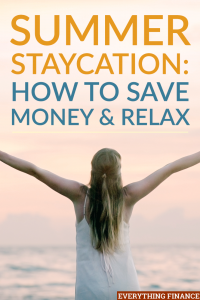 With a staycation, you don’t even have to pay for a hotel room if you don’t want to, which drastically reduces your costs. You essentially enjoy the benefits of your local town. Live by the beach? You could do a day trip to the beach. Live by mountains? You could go hiking for the day. Live near the snow? You could visit a local nature reserve. Some families do choose to get a hotel, and with apps like Priceline and Hotel Tonight, which offer steep discounts on same-day hotel bookings, you can still save lots of money on your family vacation. And don’t forget that you’re not spending on airfare, and since this is not an extended road trip, you’re also spending very little on gas! Cutting out your transportation and lodging expenses is a huge money-saver. Too often, we resort to paying big bucks for attractions that will keep our families occupied, like going to the movies, or an amusement park. We forget that to really relax, you don’t need very much entertainment at all, but just each other’s company. Take advantage of the local free things your town offers, like hiking, lakes, beaches, parks, picnics, discounted museums and any local attractions and venues that you always seem to forget about because you’re too busy focusing on the minutiae of the day to day. When my husband and I visit a new place, one of our favorite things to do is try the food! We love food so we’re always willing to try new things. But with staycations, we already know what we like to eat in our local neighborhood haunts. Now, don’t forget that the purpose of a staycation is to relax at a reduced cost, with the key being relaxation. So that means mom gets to relax too and if that means pitching in for Subway footlongs for the whole family instead of mom making and packing everyone’s sandwiches, then so be it. Mom should also get to enjoy her staycation. In fact, one of our favorite ways to spend a local staycation day is to pack the sand toys and go to our local beaches and veg out. We almost always pack some fruit and a Subway sandwich for lunch. It’s a cheap way to have a family fun-filled day. If a fancy vacation to Europe is just not in the cards for you this year, don’t worry. Pay off debt, save up, and go some other time. But paying off debt doesn’t mean you have to become a miser until you’re debt free. You can still enjoy staycations at a budget-friendly price point that will allow you to enjoy your family and get some much needed R&R. Have you ever taken a staycation? Did you enjoy it?